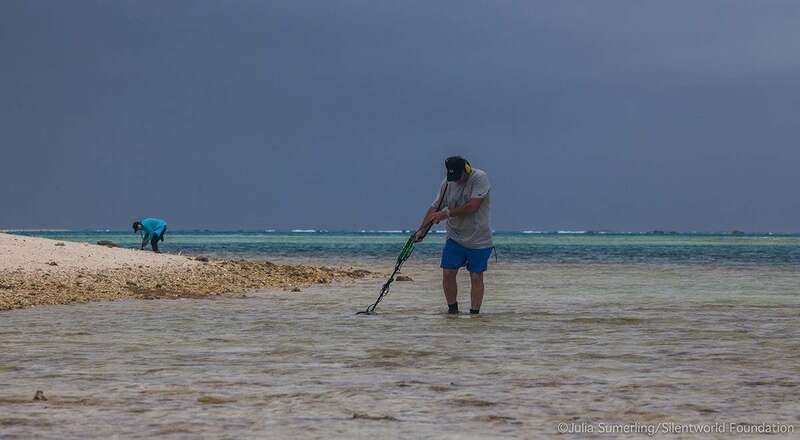 Silentworld Foundation CEO and project team leader John Mullen uses a metal detector to search for artefacts in shallows off Observatory Cay, while Jacqui Mullen (background) documents a find. Image: Julia Sumerling/Silentworld Foundation. 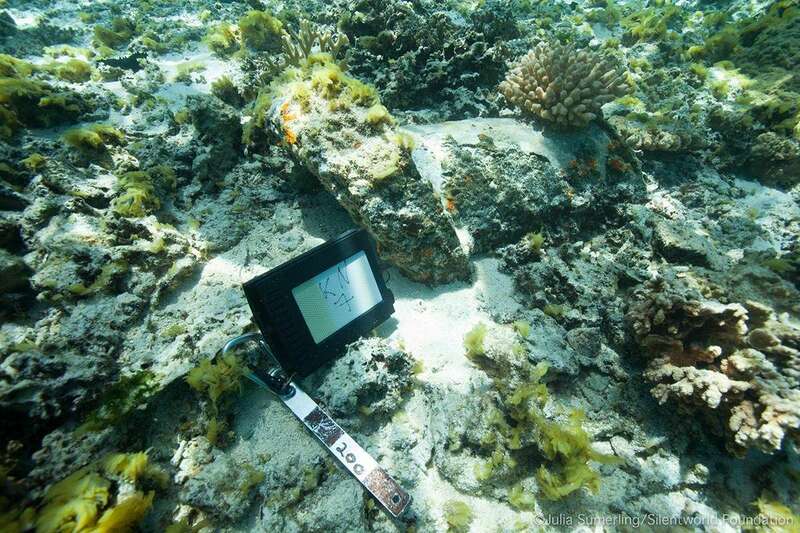 While the magnetometer crew conducted its initial search west of Observatory Cay, a second team embarked upon a metal detector survey of the cay itself and searched for evidence of survivor camps associated with the wrecked vessels Bona Vista and Jenny Lind. An English snow of 237 tons, Bona Vista was travelling from Sydney to Mauritius when it struck the far south-eastern edge of the ‘foot and ankle’ in the early hours of 18 March 1828, was forced on the reef, and ‘hove over on [its] beam ends’. Incredibly, all of the crew survived and were able to get to Observatory Cay, ‘four miles to the West South West’ of where the brig came to grief. For the next eight weeks the crew salvaged material from the wreck and built a small cutter, named Hope, with which they intended to escape Kenn Reefs and sail to Batavia (modern-day Jakarta, Indonesia). Just days before setting sail, Bona Vista’s survivors were rescued from Observatory Cay by a passing ship. However, Hope and three crewmen were tragically lost during the rescue when the cutter capsized as it was being taken under tow in heavy seas. This fragment of copper sheathing found on Observatory Cay could be a remnant of salvage activities by shipwreck survivors. Image: Julia Sumerling/Silentworld Foundation. Twenty-two years later, the 484-ton barque Jenny Lind wrecked at Kenn Reefs while on a voyage from Melbourne to Singapore. As occurred with Bona Vista, Jenny Lind grounded in the early morning and was forced on its beam ends, but the wreck miraculously resulted in no loss of life. All crew and passengers—including two women and three children—were transported to a ‘coral bank, partly covered with sand…about half a mile away’ from the wreck site, where they eked out an existence for the next 37 days. Critical to their survival was the manufacture of a water distillation system from copper cookware and lead piping salvaged from Jenny Lind. The device, designed and built by passenger Phillip Beal, was reportedly capable of converting 25 gallons (114 litres) of seawater into drinkable freshwater per day. The crew, meanwhile, salvaged timber, rigging and sails from the wreck and constructed a ‘schooner-rigged boat’ capable of carrying 22 people. On 29 October 1850, this vessel and Jenny Lind’s only surviving ship’s boat (a small cutter) set off from Kenn Reefs for Brisbane, where they safely arrived after a voyage of approximately three weeks. Observatory Cay was the obvious destination for shipwreck survivors at Kenn Reefs, as it offered the nearest refuge—if a low sand bank with no ground cover measuring approximately 150 metres long by 50 metres wide could adequately qualify for such a label! Although ephemeral, the camps and boatbuilding sites established by these castaways were anticipated to yield some form of material evidence, the most likely candidates being durable objects manufactured from metals such as iron, as well as copper and its alloys. 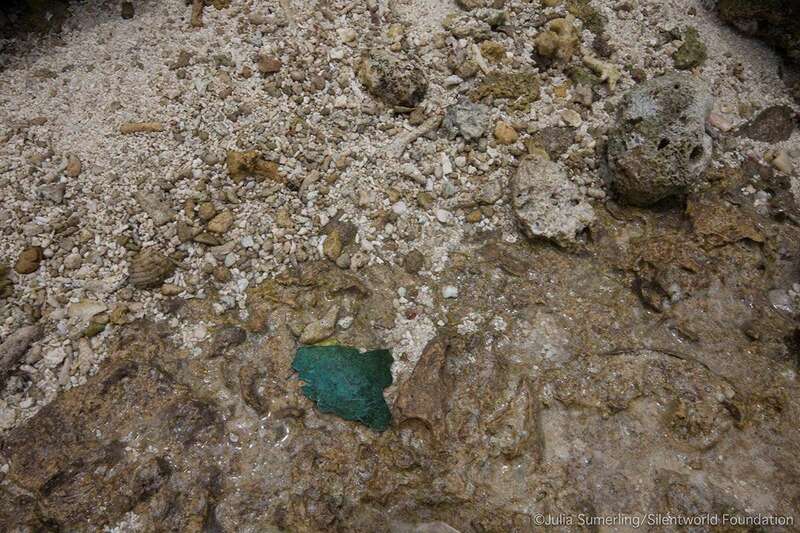 As expected, a number of metallic artefacts were encountered, including several fragments of copper sheathing and a handful of iron ship’s fasteners of varying types and sizes. The metal detector survey extended into the shallows surrounding the cay, and led to additional discoveries, including iron mast components, ceramic fragments, and a heavily-abraded glass deck prism. Collectively, these artefacts could be vestiges of salvage, ship-breaking, and construction activities carried out by shipwreck survivors as they attempted to recover and repurpose useful material. Analysis of their plotted positions may reveal specific activity areas on Observatory Cay and potentially identify where, for example, Hope and Jenny Lind’s ‘schooner-rigged boat’ were built and launched. On the morning of 12 January, Maggie III’s intrepid survey crew made another attempt at relocating Warren Delaney’s elusive shipwreck site…and were again foiled. Undeterred, they then towed the magnetometer to the east of Observatory Cay in an effort to find an iron mast section found by Delaney and Brook Batley in 1987. Although several passes were made at and around coordinates extrapolated from Delaney’s report, no anomalies were detected, and the crew extended its survey of the lagoon further to the east in hopes of finding material associated with Bona Vista. Unfortunately, the magnetometer did not register any contacts, but the team was able to obtain Global Positioning System (GPS) coordinates for prominent landmarks on the reef, and visually search for large artefacts on the reef top that may have been missed during the 1987 survey. While the magnetometer crew conducted its work in the lagoon, the other team relocated and inspected three shipwreck sites on or immediately adjacent to the reef top. All were originally documented by Delaney and Batley, and mostly comprise discrete scatters of large, robust iron artefacts such as anchors, anchor chain, deck winch components, iron frames and hawsepipes (iron pipes in the bow of a vessel through which anchor cables passed). 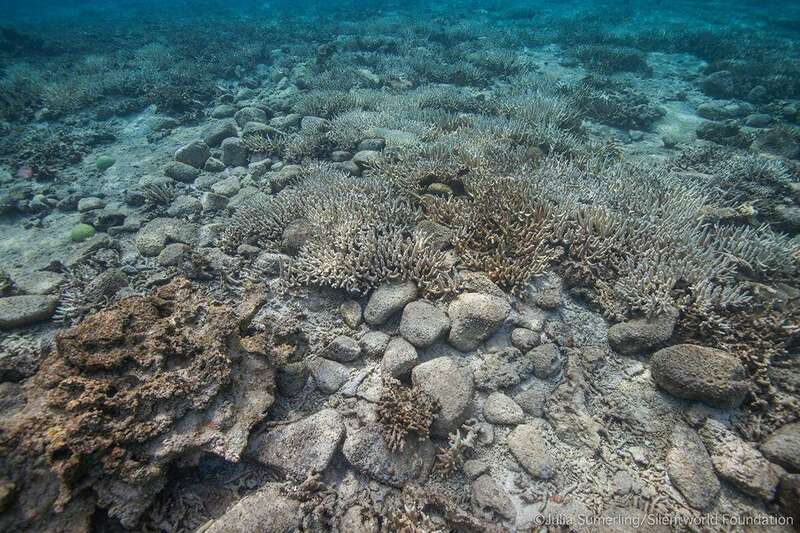 By far the largest and most visible of these sites is ‘KR [Kenn Reef] 2’, characterised by three large (approximately three-metre long) Admiralty-pattern anchors—one of which has its iron stock installed and a fluke ‘picked in’ on the reef top. 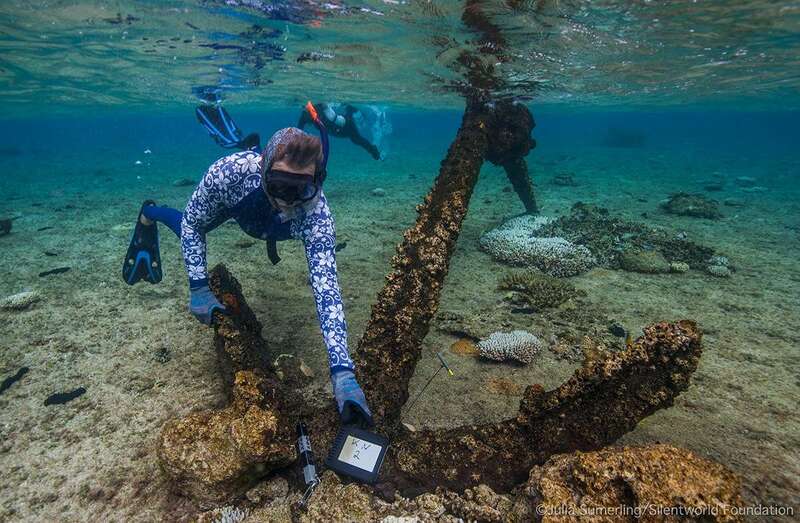 In addition to the anchors, the site features a 20-metre length of stud-link chain attached to a hawsepipe, an iron anchor stock, iron knee, scattered deck winch components, and several large unidentified corroded iron objects. Maritime archaeologist Pete Illidge examines one of three large Admiralty-pattern anchors at site KR2. Image: Julia Sumerling/Silentworld Foundation. A short distance inshore of site KR2, the crew relocated KR7, described by Delaney as a scatter of ‘[hull] sheathing [fragments], broken earthenware storage jars, broken glass bottles…a brass door lock, pulley sheave, and a brass bolt’. With the exception of a copper-alloy bolt, none of the artefacts observed in 1987 were noted; however, the team discovered several new objects, including iron frames, a section of anchor chain, several winch or capstan components, and two hawsepipes. They then snorkelled in an area visited earlier in the day by the magnetometer team in an attempt to visually relocate Delaney’s iron mast section (KR5). 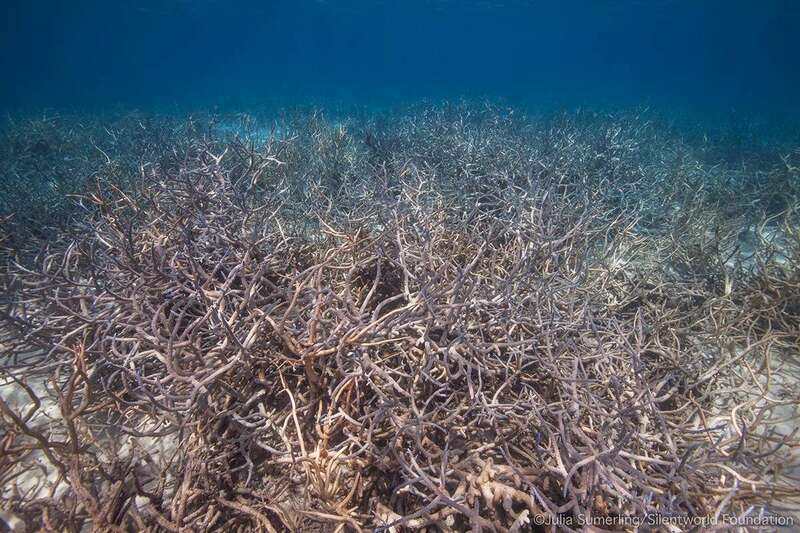 While this search was also ultimately unsuccessful, the team at least had the pleasure of snorkelling among immense, healthy clusters of staghorn coral (Acropora cervicornis). Although the team failed to relocate the iron mast section at site KR5, they were treated to spectacular forests of staghorn coral. Image: Julia Sumerling/Silentworld Foundation. One of two hawsepipes discovered during the team’s inspection of site KR7. Image: Julia Sumerling/Silentworld Foundation. The day also resulted in the discovery of a new site, comprising a large scatter of ballast stones within the lagoon. Ballast was placed in the lower hull of sailing ships as a means of improving their stability in the water, and various forms of heavy material — including large stones, iron blocks, sand, and gravel — were sourced for the purpose. Stone was by far one of the most common forms of ballast during the Age of Sail, and its presence in the lagoon was both unnatural and immediately obvious. This scatter of stone ballast was a new discovery, and may cover remnants of a shipwrecked vessel’s hull. Image: Julia Sumerling/Silentworld Foundation. The team inspected the ballast scatter and its immediate surrounds, but did not observe any artefacts or structural remnants associated with a ship’s hull. It may be that hull remains are buried beneath the ballast and coral colonies that have grown within and around it. Alternatively, the scatter could represent ballast that was deposited by a broken section of hull that later floated away or disintegrated. It may also have been intentionally discarded by shipwreck survivors, although this seems less likely. The next blog post will chronicle the team’s survey of the reef top…and the discovery of two more previously undocumented shipwreck sites. Stay tuned! Explore more about the museum’s maritime archaeology initiatives at our website and on our blog. You can also listen to an interview with James on Radio National about from the expedition, here. With thanks to our maritime archaeology program partners, Silentworld Foundation. Dr James Hunter is the inaugural Curator of RAN Maritime Archaeology at the Australian National Maritime Museum. He received his MA in historical archaeology from the University of West Florida, and holds a PhD in maritime archaeology from Flinders University, where he is an Associate Lecturer in the Department of Archaeology. James has worked in the field of maritime archaeology for nearly two decades, and during that time has participated in the investigation of shipwrecks and other archaeological sites ranging from prehistory to the modern era. He was a member of the archaeological team that investigated the American Civil War submarine H.L. Hunley, and a staff archaeologist with the U.S. Naval History and Heritage Command’s Underwater Archaeology Branch. He has been published widely and is also an accomplished archaeological illustrator whose work has been featured in a number of scholarly books and articles.